Good Morning Blog Family!! I hope y'all are having a great week, and are looking forward to celebrating the Holiday Weekend! To kick start your Fourth of July food fest, I have a fantastic Foodie to share with y'all today!! Vera, from Vintage Vera is sharing TWO fabulous recipes with us today, both of which would be fantastic for your Holiday get together's! Vera and I met through Facebook, and I remember when I first came across their page, I truly felt like I had come across something special. 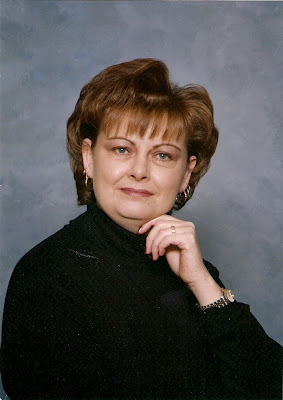 Vera along with her sister Phyllis have created a great "Home" on their page, where you can share your memories and recipes and just feel like you've always got a friend. They also get a bit silly at times (just like all Sisters do!) and make you feel like a big part of the Vintage Vera family! I've recently gotten the chance to look over their cookbook to do a review on Country Cooks Across America (which will be posted tomorrow morning!!) and I just have to say I loved it. They are such a fantastic team, and I feel so blessed to know them! Now enough from me... I give you Vera! Q: Tell us about yourself and your family. A: I have always lived in Winston-Salem, NC, and I am Southern to the core. My husband, Jack is my BFF. He is a treasure and I love him as much today as I did when we married 27 years ago! With no children, our kids are our pets (currently cats named Earnie and Loucie). Usually we have one or more dogs as well, but not at this time. I have siblings all over the map. The oldest is Garland Davis. He and his wife live in Hawaii. Next is John Salmons. He and his wife Candy live in King, NC. Finally, Raymond (aka Tommy) and his wife Bonnie live in Southern California. All three were in the military in the Vietnam era, -- add their enlisted years together and it is almost 60 years of service to our country! My sister Phyllis Salmons lives in Daytona Beach, FL. She works behind the scenes with me on my Facebook Page (Vintage Vera). Phyllis will present the guest recipe for The Farmer's Wife on July 29, so please come back and see what she will come up with! I also have two nieces and two nephews, all grown today. Having been close to Mama my entire life and having to deal with the circumstances with her final years, gave me a great compassion for senior citizens. Although I have many years of work experience in banking and insurance, after Mama passed away, I was inspired to work in association with helping the elderly. Today I work with a non-profit agency helping senior citizens, especially in matters regarding budgeting and finances. Q: What is the purpose of the Vintage Vera Facebook page? A: I love history and what we call "front porch stories." When I was a child, the adults sat on the porch in the evenings and talked about a wide variety of subjects and issues. The children playing nearby learn many life lessons and memorable stories by overhearing some of this exchange. We don't have the literal front porch for a social outlet anymore, but at Vintage Vera we have created a "virtual front porch." Now we can visit with neighbors around the world and stay as long as we wish! A wide variety of subjects come up and you know one of those is food! No matter where a person is from, we look forward to their next visit to Vintage Vera and their ideas and input on our discussions, notes, and photos. Q: What do you first remember cooking? Today Jack and I work together in the kitchen with the cooking. He is always interested in trying new recipes and pitches in with as much of the preparation as needed. In fact, all of my brothers are pretty good cooks too! Jack and I have Mama's fruit trees in the back yard and we grow our own vegetable garden. We enjoy the harvest year round by canning apple butter, pear preserves, tomatoes, pickles, and whatever else strikes our fancy. A: That's easy! Pinto beans, turnip greens, sliced tomatoes, and homemade cornbread! I am not a big meat eater, although I am not a strict vegetarian. I absolutely cannot stomach any kind of seafood so don't even suggest it! Now here are two recipes from Vera -- shall we say Vera's Vintage Vittles? 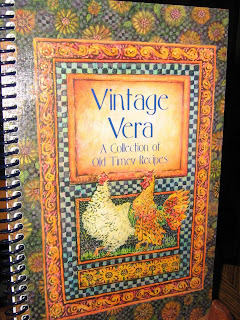 Thanks so much to Kim, The Farmer's Wife, for allowing me to share a couple of recipes from our Vintage Vera Cookbook! I'm sure you will agree that farmers and their wives are among the unsung heroes of our great nation! Thanks Kim -- we appreciate everything you do -- on the farm, for your wonderful family, and sharing with us via the internet! With it being the middle of the summer, the last thing I want to do is to heat up the house by cooking. Growing up in rural North Carolina tobacco farming country, we didn't have air conditioning so it was important to Mama to keep from heating up the rooms even more. Today, I still think it is a good idea, even with good air conditioning. These recipes are great summer fare for a number of reasons! First of all, you don't have to stick strictly to the stated amounts. Mama used to do a lot of cooking just putting in some of this and some of that, as she would say, "till it looks right." The only cooking required for the veggie pizza is to brown the crust in the oven (that's not going to heat up the room too much)! As far as the vegetables go, you just toss on what you have from the garden or in the refrigerator, as much or as little of each as you wish! The salad takes care of the available fruits you have on hand! Heat oven to 375. Unroll both cans or dough, separate into 4 long rectangles. In an ungreased 15 x 10 x 1 pan, place dough in pan -- pressing to seal all openings. Press up the sides of the pan to form a crust. Bake 13 to 17 minutes or until golden brown. Cool completely, about 30 minutes. In a bowl mix the cream cheese, sour cream and ranch mix until smooth. Spread over the baked crust. Top with vegetables and cheddar cheese. Serve immediately, or cover and refrigerate 1 to 2 hours before serving. Cut into 8 rows by 4 rows. Optional: If you want meat on the pizza, toss on chunks of ham, chicken, or pulled pork. It's all up to you! Cover and refrigerate leftovers. Mix fruit, confectioner's sugar, and vanilla in a bowl. Refrigerate 1 hour or until ready to serve. For Raspberry Fruit Salad: Prepare as directed use McCormick's Raspberry Extract in place of the vanilla. If you have another fruit on hand, like blackberries or fresh peaches, just add them in. When ready to serve, if desired slice a small banana on it (do this last so that the banana will not brown). Q: Tell us about the Vintage Vera Cookbook. 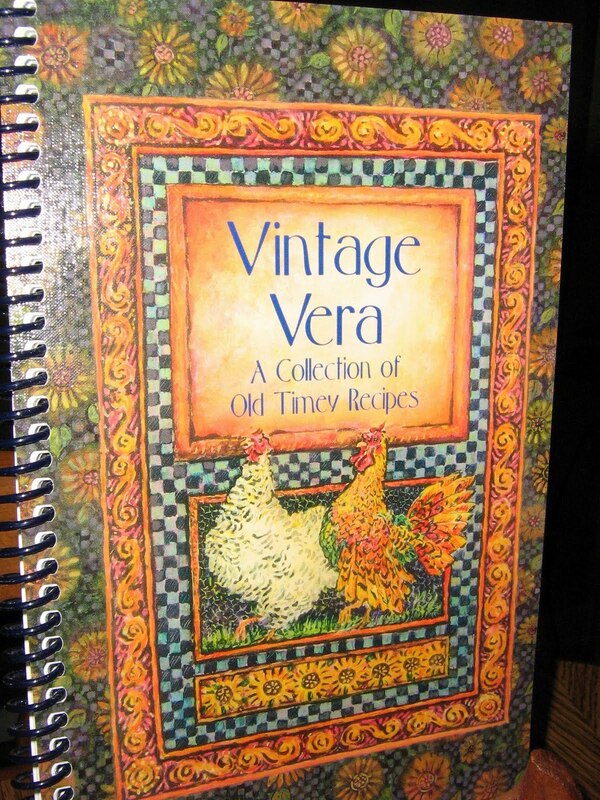 A: Vera and Phyllis compiled the Vintage Vera Cookbook in 2010 to document the recipes served by Mama and Granny -- some of these dishes they had not even thought of in years. Mama rarely referred to a recipe. As her health was failing, we were unaware of the fact that everyday just after breakfast, she would write down her recipes in a composition book. I never knew of this book until after she died and her nursing assistant told us about her spending the time writing it. The penmanship was weak and not her beautiful handwriting that I remember. I know that she was preparing it for us so that we would know how to cook these dishes when she was gone. Upon finding this treasure, we knew it was just like her to never say a word about it. 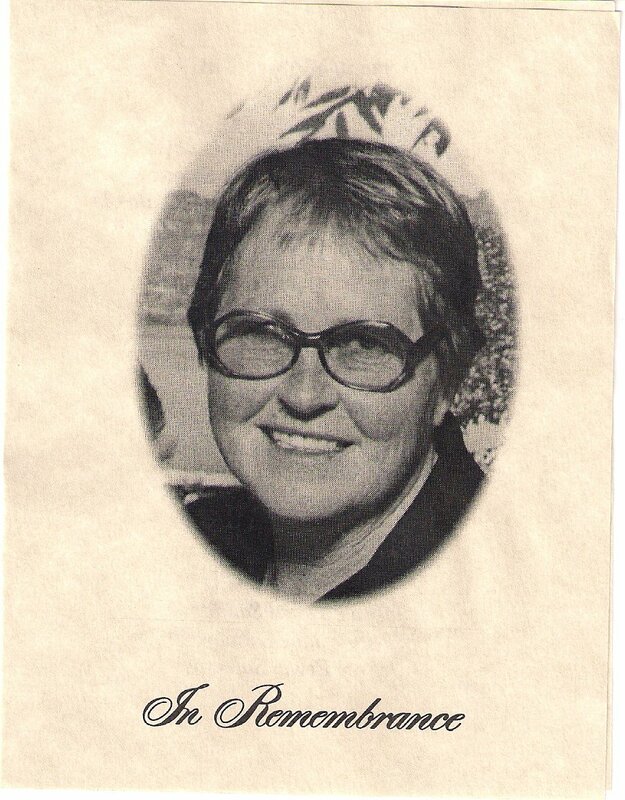 After many calls to the siblings, I came up with the idea of compiling a cookbook, indicating that certain dishes are in her memory and others were credited to Granny. This cookbook is very special to us -- a trip down memory lane as we compiled it -- and a culinary delight when we cook and reap the rewards. Through this cookbook, we feel closer to Mama and consider it a preservation of her love. Until we started comparing notes with other people, we had not seen some of these recipes outside of our Mama's kitchen. 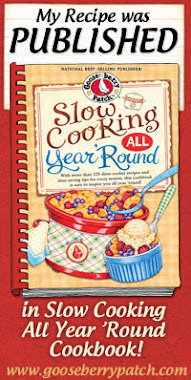 Many of our family and friends had grown up with similar culinary fair and relate to this cookbook easily. In addition to the recipes Mama wrote down, our aunts and cousins and other friends were kind enough to provide recipes for many of their favorite dishes. Many of them are likewise designated to be in memory of the loved ones whom we associate with that dish. Included in the Vintage Vera Cookbook are Mama and Granny's recipes for "putting up" the harvest of the family garden and fruit trees. Today, in addition to canning apple butter and pear preserves from Mama's fruit trees, Jack and I can Grape Leaf Pickles with the products of the backyard grapevine, and we plant a vegetable garden allowing us to can other favorites like tomatoes. Until July 4, a special benefit is being held from the sale of Vintage Vera cookbooks to benefit the victims of the late April tornadoes in Alabama, Georgia, and Tennessee. Details can be found on the Wall, the Notes Tab, and the Shop Now Tab of the Vintage Vera Facebook page. After July 4, donations from the sale of the Vintage Vera Cookbook will go to a non-profit organization call HERO (Horse Education and Rescue Organization). HERO helps abandoned and mistreated horses, getting them the help they need and then they seek to place to horse in a location where they will be properly cared for. We hope you will consider participating in Vintage Vera and spreading the word about all of the chatter happening on the virtual front porch! You will find it quite enjoyable! Once again, thanks to Kim for offering me the opportunity to share my memories of Mama, for this is indeed what these recipes are to me and my siblings. How rare for a mere cookbook be so sentimental! When you come to visit Vintage Vera, be prepared to laugh! I hope to see your comments soon over on our front porch and if you are interested in our cookbook, just just let it be known! Welcome friend and y'all come back now, ya hear? I just have to say first of all Thank you SO much Vera for sharing your heart and your recipes with us today! I can't wait to give them a try, with our summer heat you can bet these will be made ASAP! 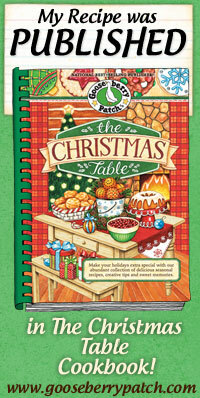 I really hope y'all will go check out Vera and Phyllis on Facebook and take a peek at their cookbook. Also at the end of the month Phyllis will be sharing some more of Mama's recipes with us!! I hope you'll enjoy sitting on the Front Porch alongside Vera and Phyllis! What a wonderful post! So glad to get to know you better. This pizza would be lovely for a bridal or baby shower! I love the bit of ranch dressing in there. Such a great addition. Lovely host and guest poster! Happy 4th of July! Hi Kimberly and Vera, such nice recipes and nice to meet Vera. Sorry Kimberly been so busy, but I got that pie mold at Williams Sonoma. Hope both of you and your families enjoy the Holiday weekend. I'm looking forward to a little relaxing. Great post from Vera and the host. Looks like two wonderful recipes for us to try, too. A great cookbook by two great sisters. Have a great 4th, too. I am new to your blog and love all the delicious recipes you share. I can't wait to try those corn dog bites. My kids will love them! Love the simple recipes and the post really warmed my heart. Nothin' like passing on what we learned from mama...very sweet!